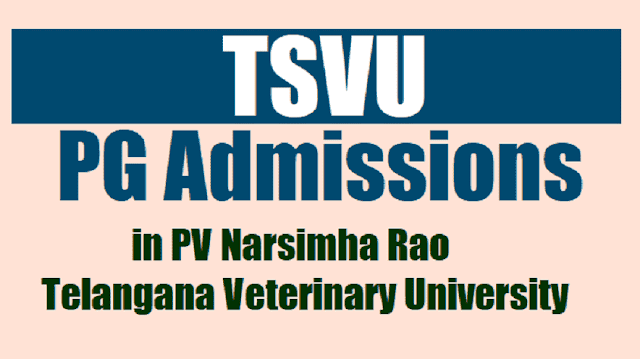 TSVU PG Admissions 2018 in PV Narsimha Rao Telangna Veterinary University, Master's and Doctoral Degree programme admissions: TSVU PG Admissions 2018, TS Veterinary University PG admissions, Online application form, Last date for apply, Prospectus and more information @ tsvu portal. PV Narsimha Rao Telangna Veterinary University has published the PG Admission notification and applications are invited from the eligible candidates for admission into the Master's and Doctoral Degree programmes in the Faculty of Veterinary Sciences in PV Narsimha Rao Telangana Veterinary University, Rajendramnagar, Hyderabad for the academic year 2018-2019. Applications are invited from the eligible candidates for admission into the above said courses in Faculty of science in PV Narsimha Rao Telangna Veterinary University for 2018-2019. Filled in application forms are to be sent to below said address. for application and other information please visit the PV Narsimha Rao Telangna Veterinary University Officiall website: http://tsvu.nic.in/. For application form, Prospectus and other related information visit the official.